Happy January, friends! I hope the start of 2019 has been good for you. As I mentioned over on my Instagram, this year I plan to introduce a new theme/topic every month on the words and ideas that impact women everyday and how we can wrestle with them prayerfully. January is typically all abuzz with phrases like “a fresh start” and “new year, new me”. But tied into these notions of transformation lies a deep underlying insecurity in my view - as if there is something MORE we need to be, as if we have to be BETTER than who we were last year. But why have we bought so much into the idea that being productive means constantly changing and bettering and improving, accomplishing 14763 things in a day, exhausting ourselves and never feeling quite enough if we haven’t done what we were “supposed” to do? I’ve struggled with being productive for as long as I can remember. Very often, I feel overwhelmed by the number of things on my to-do list. And there have been countless times in my life that I went to bed thinking of ALLL the things I had to get done the next day. In my former job, being productive meant that I had to juggle a billion things at the same time. Multi-tasking was the norm. Skipping meals or eating at my desk while working happened often because I felt like I just didn’t have time to spare. But instead of feeling accomplished whenever I finished one task, there was never time to breathe or rest because tons of other tasks were just waiting for me to get them done. I remember one incident very clearly: I was on holiday with my then-fiance in Bali, where we were planning to do our pre-wedding shoot and also relax a little before wedding madness began. But I couldn’t let go of all the things I had to do for work, and instead of enjoying the sunshine and relaxing by the pool, I was in the hotel room pounding away at my laptop keys… until my laptop got stuffed into the hotel safe and locked up. I recall leaving the hotel room and walking through a tree-lined path with pockets of sunlight peeking through and feeling like I could finally breathe again. Like a weight had been lifted off my shoulders and I could clearly see the kind of life I was leading right now… and it was just so unfulfilling and draining. In many ways, being productive for me has more or less been defined by and confined to the sphere of work. But what if productivity isn’t just about working hard and meeting all your deliverables in one go? What if productivity can be extended to other aspects of life besides work? Those books on productivity tend to focus on the workplace. They push us to be productive in the area of life that is most visible and that consumes the greatest part of our time. But they rarely speak to life with our families or to who we are when we are alone. In their view, productivity is a nine-to-five pursuit. Most of us tend to measure productivity by the volume of our activity, by the number of things we can cross off a list by the end of the day. But at its best, productivity isn’t first about getting stuff done, but about getting the right stuff done. And this then raises the obvious question: What is the right stuff? The right stuff is whatever fulfills God’s calling to do good for others and bring glory to him. Productivity needs to get kicked off the pedestal it’s been put on. Productivity needs a huge overhaul in our minds. Another thing I’ve come to realise is that for women, it’s so easy to sell ourselves short and imagine that we need a title, a position, or something MORE to define us and help us be acknowledged and recognised. Perhaps that’s why we love finding out about how other women seem to be doing it all and having it all. I mean… how do these other women ace motherhood, have a gorgeous home and look impeccably stylish 24/7?! Beneath it all, though, I wonder what truly motivates us when we strive to be as productive as these women we admire and wish to emulate. And I would like to raise a clarion call for us to re-think productivity, to see it through scriptural lens, and to re-evaluate the kind of productivity we wish to pursue. 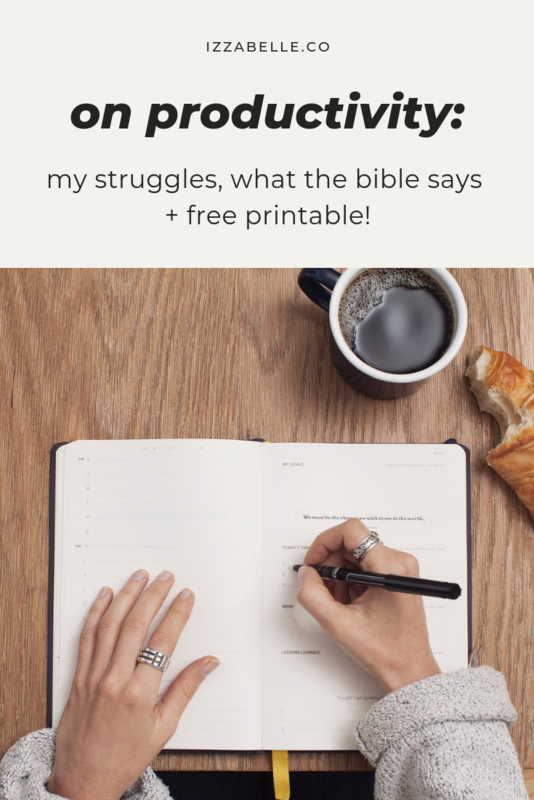 Get your free prayer for productivity printable here! The wonderful thing about being productive in the Bible is how closely the concept is associated with another: REST. The creation story is testament to how important rest is - not so much because God was tired out from all that creating and shaping and moulding, but the fact that He chose to pause and bless and rest holds so much significance in the way He calls us to lead our lives. Jesus, too, would often escape the crowds of people seeking to hear His voice and receive His touch and head to a quiet place to pray - even though he had so many demands on His time and countless needs that had to be met. That Jesus privileged prayer, silence and solitude amidst a busy, chaotic world also reflects a scriptural basis for incorporating rest into our daily rhythms. These days, I intentionally incorporate rest into my daily schedule, because having time to rest is just as important as the tasks I set out to do. Whether it’s reading a book, taking a nap or watching a dramedy, these little pockets of rest help me to recharge, and I return to the tasks at hand refreshed. Ken Shigematsu’s Survival Guide for the Soul has also been instrumental in re-evaluating and shaping how I view and approach productivity. I’m currently practicing putting time with God before everything else, and it has been so wonderful to “reap” the benefits of doing this. I find myself less distracted and less overwhelmed, and better able to show grace to myself when my plans don’t go the way they’re supposed to - like when I haven’t written something for the blog that I’ve wanted to for months (whoops!). I used to beat myself up mentally for not being able to do this and that, but I’ve realised how unhealthy that way of speaking to myself is, and it’s something I truly need God’s power to break out of. What does being productive look like for me and you? Like I said earlier, it’s so easy to define being productive solely in the area of work. It’s where my mind naturally focuses on when I think of the word “productivity”. But being productive shouldn’t be restricted only to our jobs. So I took some time to think this through, and I wrote out what being productive looks like for me in my journal, and I encourage you to do the same! Being productive isn’t just about getting things done at the expense of everything else; it’s about being intentional in what to spend my waking hours on, and allowing myself to rest at the end of the day. It’s about realising that all I do and achieve is in God’s hands, not mine. And that whatever I purpose to do is only by His strength, power and grace. I’ve also been thinking of productivity in a larger context, i.e. how can I fulfill God’s call on my life? What are the causes I can contribute to and what are the people or programs that God is drawing me to invest my time and energy in? As believers, we have an innate desire to do good and see real, effective change in this world - but that is a little too abstract. When distilled into actual, actionable things to work toward, I find that I am able to live more productively and purposefully. A prayer for productivity - FREE printable! Weary, burnt out and feeling like you have the weight of the world on your shoulders? I feel you - and I’ve been there. I wrote a little prayer to help us remember to stop defining productivity the way the world defines it, and turned it into a printable for you to pin up at your work desk or wherever you think might help most. You can get this FREE when you join my mailing list below! Jesus, I want to see productivity the way You see it. What are your thoughts on productivity, and where do you find you need prayer in? I would love to hear from you - drop me a comment below or email me at izzabelle.ong@gmail.com!